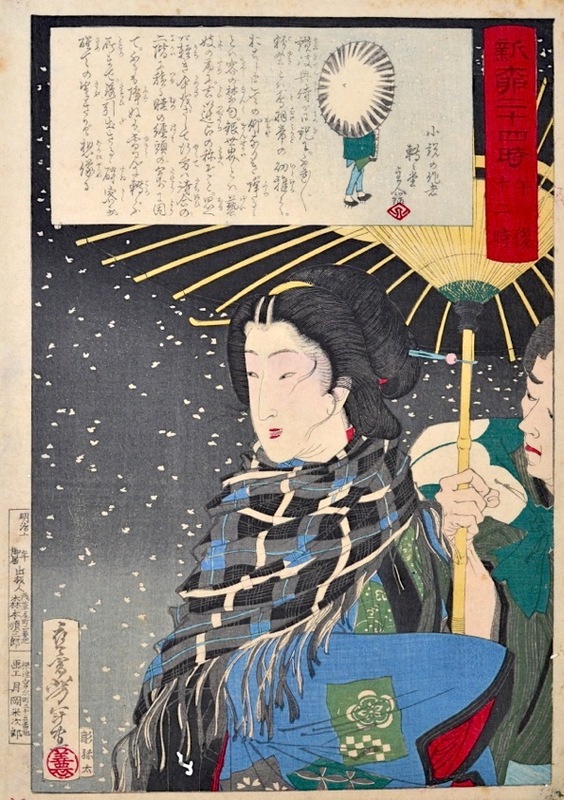 Taiso Yoshitoshi (1839 - 1892) Twenty-Four Hours at Shinbashi and Yanagibashi (Shinryu nijushi toki) 12 midnight - Geisha walking with attendant in snow, (1880). Oban. We have several prints from this very fine and increasingly rare series by Yoshitoshi from 1880. In the late Edo period the area of Shinbashi and Yanagibashi became the new focus of entertainment and prostitution. What became the main Tokyo Railway Station opened here in 1872 and by the 1880's, with modernisation in full spate, the area came to symbolise the new, patriotic, modern Japan. There is a great deal in this series that aspires to the modern, in spite of the traditions of the geisha and of prostitution that it depicts. The notion of documenting the courtesan’s day was not new and had been exploited already by artists such as Utamaro. In this series, Yoshitoshi depicts twenty-four scenes of women performing different tasks, one for each hour of the day. Notable is Yoshitoshi’s use of the Western 24 hour clock. Japan had only recently moved from the traditional Chinese calendar and this device, along with the modern style of drawing that he was confidently mastering, gives the series a deliberately contemporary feel. Each of the prints shows a head and shoulders image of a geisha; the scenes are mundane, a geisha in bed smoking a pipe, or as in this print walking home at midnight in the snow. At the top of each sheet is a large cartouche which illustrates a prose piece written by Takabatake Ransen in the gesaku tradition; a style that requires coterie knowledge to be fully understood. This print is the final print in the series: 12.00 Midnight. It is a very fine snow piece, showing a geisha returning home. She is wrapped against the cold and a companion (perhaps a client) holds a parasol above her head. The background depicts large flakes of snow falling against the night sky. The cartouche shows a male (the same man possibly) returning alone. The print is full size. The colour, condition and impression are all very fine. A beautiful and complex design with great use of pattern, fine bokashi shading to the greys.